Tomato is an ingredient used in Provisioning to make a variety of Food dishes. As a fruit-type ingredient, all standard recipes using tomatoes will have an Increase Maximum Magicka effect. 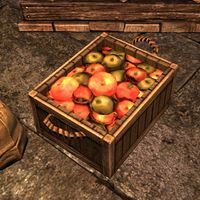 Tomatoes may be found in containers throughout Tamriel, most easily in Tomato Crates.